The key to expressive writing is that you write about something personal, something that has meaning, and often carries an emotional quality. 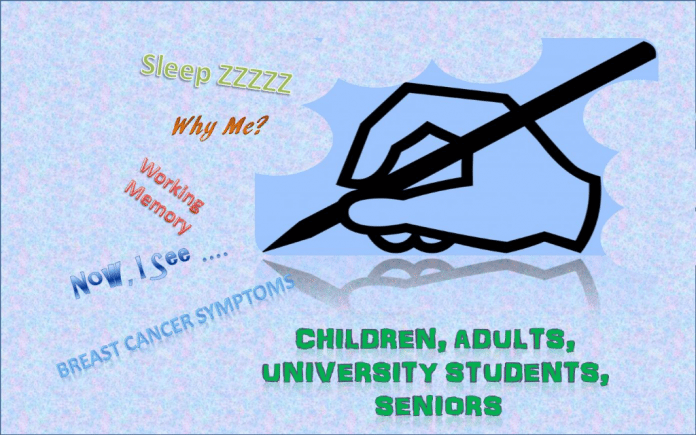 A number of recent studies show benefits of expressive writing for sleep, memory, and conditions as diverse as macular degeneration and cancer. Expressive writing can often be used to process a new experience or a momentous event. Information, sensations, and feeling come out or become clear through the writing process, which is a physical, emotional, and cognitive process. We write what is in our minds and hearts through moving our hands and arms, using the big muscles and fine motor skills. Researchers studying college students noted improved working memory capacity through expressive writing. In the first study, 35 freshmen assigned to write about their thoughts and feelings about coming to college demonstrated larger working memory gains seven weeks later compared with 36 writers assigned to a trivial topic. Increased use of cause and insight words was associated with greater working memory improvements. In the second study, students who wrote about a negative personal experience enjoyed greater working memory improvements and declines in intrusive thinking compared with students who wrote about a positive experience or a trivial topic. A total of 23 acupoint stimulation, massage therapy and expressive writing randomized controlled trials were included in the review. The study showed that no single intervention could be put under the spotlight exhibiting an overall effective result on all measured outcomes; however, looking into each one in detail shows different results in specific outcomes. Among the three interventions, acupoint stimulation has a treatment effect for general pain and fatigue, massage therapy has a treatment effect for anxiety, and expressive writing has a treatment effect for quality of life. Mostly when we think about macular degeneration with think about vision problems of older people but children can also develop a kind of macular degeneration called Stargardt’s disease. A recent study showed the benefits of expressive writing in children with Stargardt’s disease. The children who participated in the expressive writing noted improvements in psychological health and physical health. In the therapy process, the process of disclosing about stressful or traumatic events is often considered essential. One such manner is through focused expressive writing about stressful or traumatic experiences. Focused expressive writing is related to improvements in health and well-being, across a wide array of outcomes and participant characteristics. In particular, focused expressive writing may be an effective means to reach populations unwilling or unable to engage in psychotherapy. Sleep is so important to your productivity, your relationships, and your health. What if developing a writing practice could improve your sleep and decrease your stress? In a study on the effects of expressive writing on people with cancer, researchers found a significant improvement in sleep—both the quality of sleep and the duration. Expressive writing whether prose or poetry can help us answer questions like, why me? Or what does this experience mean? Writing can help us reflect on our surroundings, experiences, and relationships. What are you writing today?